NEW YORK—An Israeli company specialized in ecologically friendly solutions for coastal and marine infrastructure is making its mark on New York City. 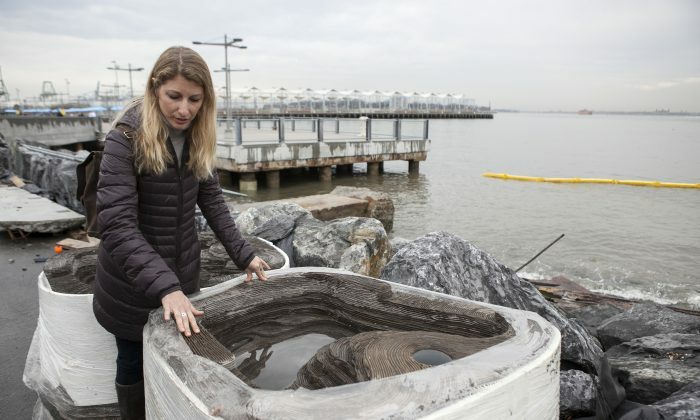 Tel Aviv-based ECOncrete is engaged in two waterfront projects in Brooklyn Bridge Park that will have a long-lasting impact on the health and stability of the marine life in the area. “It has been a really fruitful collaboration,” said ECOncrete founder Dr. Ido Sella of working with the park. Sella was in town last week and showed off the company’s newly installed man-made tide pools along the park’s coast. The man-made contraptions mimic nature with ecologically friendly material molded into grooves to create the nooks and crannies that marine life of all kinds love to burrow into. A specialized filtration system also prevents debris, oil, and other foreign elements from entering the tide pool waters. The result is a clean, sparkling mini-marine habitat amid a constructed beach of granite stones. It keeps the environs beautiful and creates a space for the study of marine life. Designed so they can be placed easily into a built environment, the park’s seven tide pools span a small stretch of shoreline between Pier 3 and Pier 4. Three more will be installed on Habitat Island, a small nature preserve just off the coast that will not be publicly accessible. The approach is in lieu of the more traditional option of encasing pilings that are decomposing or being eaten away by marine life with smooth concrete or fiberglass. That practice actually tends to introduce invasive species and decreases the health of the marine environment. It was the first time it had ever been done. As ECOncrete CEO Dr. Shimrit Perkol-Finkel sees it, her company’s approach is helping to tilt the ratio between local and invasive species. “We did change a very old-fashioned way of reinforcing piles,” said Perkol-Finkel last week while touring her company’s handiwork in Brooklyn Bridge Park. In September 2013, Perkol-Finkel and Sella went on a dive to inspect the progress of the pilot program pier pilings at the park’s Pier 6. They found they were thriving with a variety of marine life, including crabs. Elsewhere in New York City ECOncrete has a presence, both in reality and in theory, with projects at Governors Island and the Brooklyn Navy Yard. They are also part of a team in the national Rebuild By Design competition. Rebuild By Design is a federally funded competition in the Sandy-affected region to find financially and logistically feasible projects from among 10 interdisciplinary design teams. The key goal of the elite project is to find innovative solutions to rebuild and protect the environment and its inhabitants. ECOncrete is part of the SCAPE / Landscape Architecture team, whose Living Breakwaters project would “reduce risk, revive ecologies, and connect educators to the shoreline,” according to the team’s description. The breakwater units portion of the design would be made of ECOncrete. The 10 final Rebuild By Design projects were presented last weekend to the federal government. An undisclosed number of projects will be selected and funded. If ECOncrete’s team is selected, it won’t be the first type of large-scale project they’ve done. In 2012, about 40 tons of ECOncrete ecological armoring units were deployed in the waters off Haifa, one of Israel’s major port cities. That same year, the company also installed fish-friendly ECOncrete panels at the Port of Savannah. In 2011, the company’s product was chosen as one of the 10 winning solutions of the Savannah Ocean Exchange. If its success in New York City is any indication, the company has a long future ahead of it. Leigh Trucks, director of capital projects at Brooklyn Bridge Park, said she “loves” working with the ECOncrete team.